Splashed all over the pages of every magazine and media outlet, and every brand’s social media is a very clear picture of socially accepted definitions of beauty. It is no secret that there are very real aspects that are severely limiting our perceptions of what constitutes being beautiful. Some of the biggest barriers are reinforced by society at large and these barriers bleed into almost every industry, particularly in fashion and beauty. These hurdles include size, color, hair, height, face structure, shape, posture, and the list goes on. In a world that is so obsessed with aesthetics, and the “perfect face,” “perfect body,” etc. there is a dearth of diversity and representation. To the extent that even public figures, professional models, and actors, are often published after intense Photoshop edits. There is much more to beauty than fair skin, a size zero frame, and an angled jawline. This “inclusivity and breaking the barriers campaign” will help legitimize every shape, size, color, and whatever else is stopping the everyday girl from owning her fashionista status. 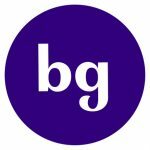 Brown Girl Magazine’s objective is to impart the everyday girl-next-door with the confidence and the courage to find her beauty within herself, know that she is deserving of just as much as any other girl, to wear whatever she wants, and be whomever she wants to be, despite society’s constrained and absurd standards of beauty. Moreover, it is crucial for today’s impressionable youth to see this type of diversity being embraced in a public forum such as this to develop a more holistic view of beauty as they are growing into their sense of self-worth and individuality. 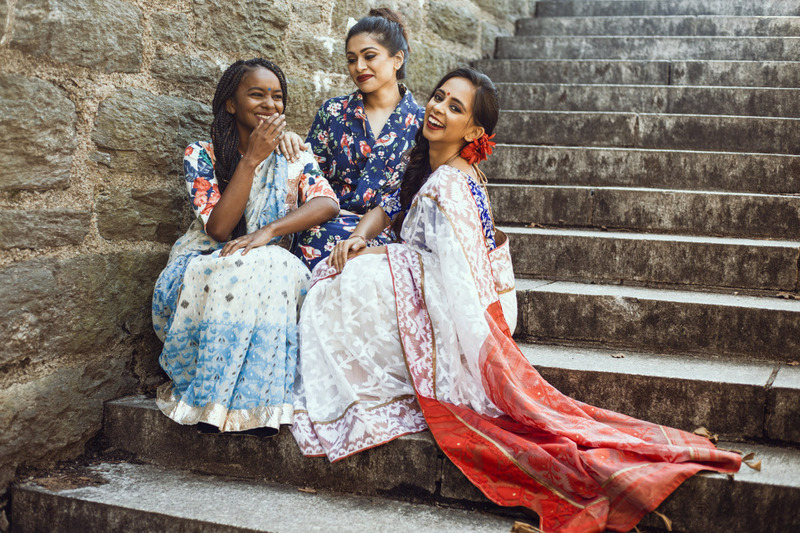 Brown Girl Magazine’s CEO and Co-Founder, Trisha Sakhuja-Walia wholeheartedly believes and supports the vision of this photoshoot because it truly encompasses the mission of the online publication to highlight and support real women. 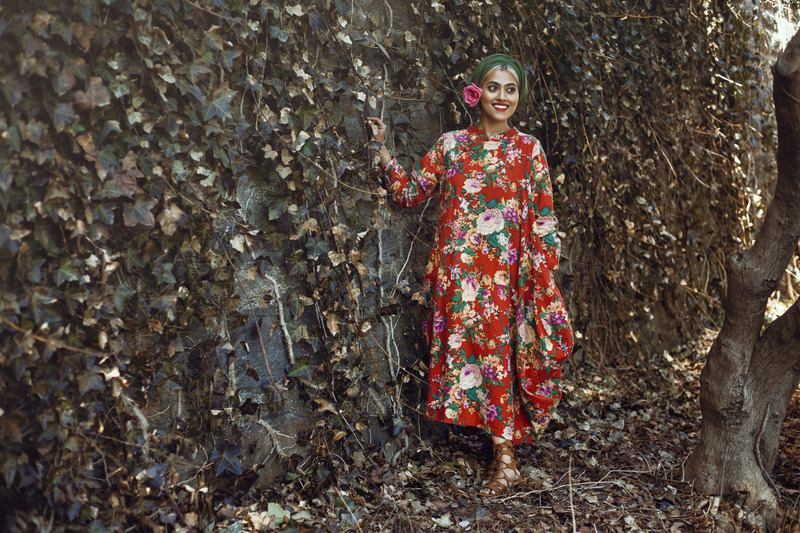 “This collaborative shoot between Ayush Kejriwal and Brown Girl Magazine spoke to me in many lengths. In several instances, culture and religion are separated, and rightfully so. That is not to say, however, that culture and religion cannot coexist in a unit, or rather in a person or an identity. 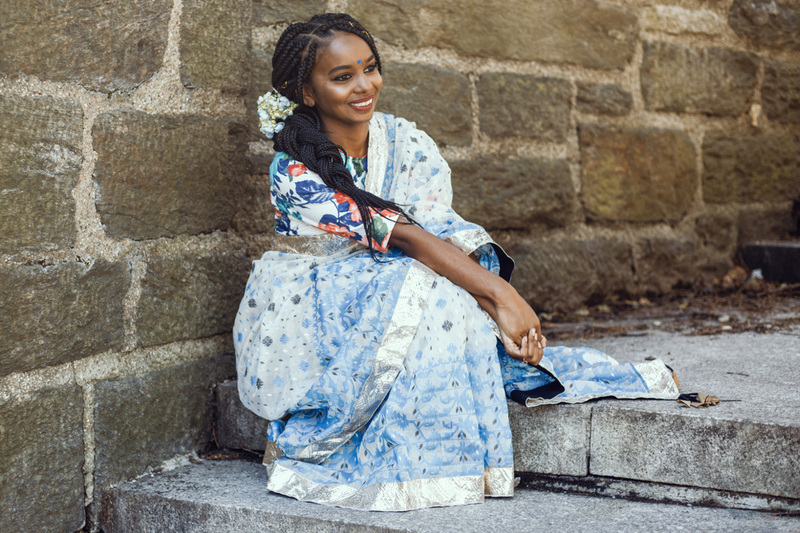 One of my ongoing goals as a fashion blogger is to represent the idea that my religion and culture both coexist in me beautifully and peacefully to create immense parts of who I am. I am grateful to be able to express that through fashion, just as I am grateful that this shoot allowed me to continue doing this. I felt empowered throughout the entirety of the shoot knowing that all parts of me were accepted. 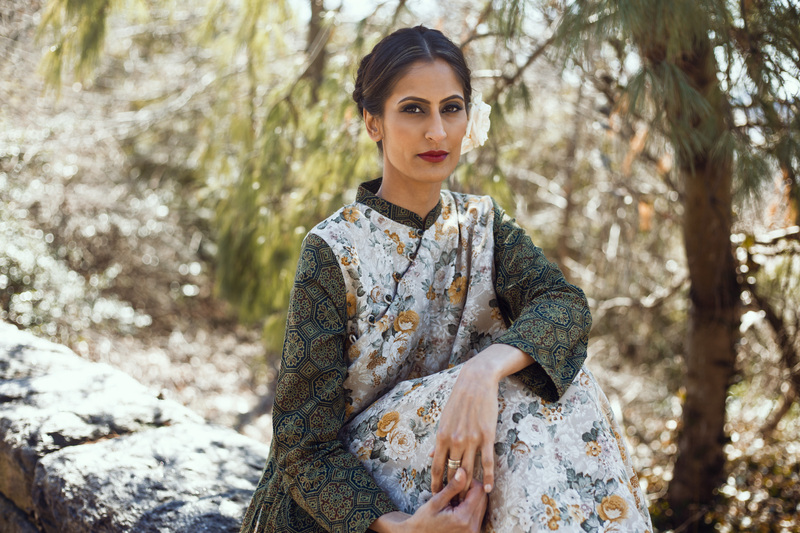 I was able to showcase being a proud, Muslim, Bengali woman while remaining effortlessly bold and beautiful. “When you are 5’10 and curvy it’s natural to feel like a giant standing amongst the average petite desi girl. It’s taken me years to embrace my body and feel comfortable in my own skin. I’m now proud of how tall I stand, my uniqueness and the way my body curves. 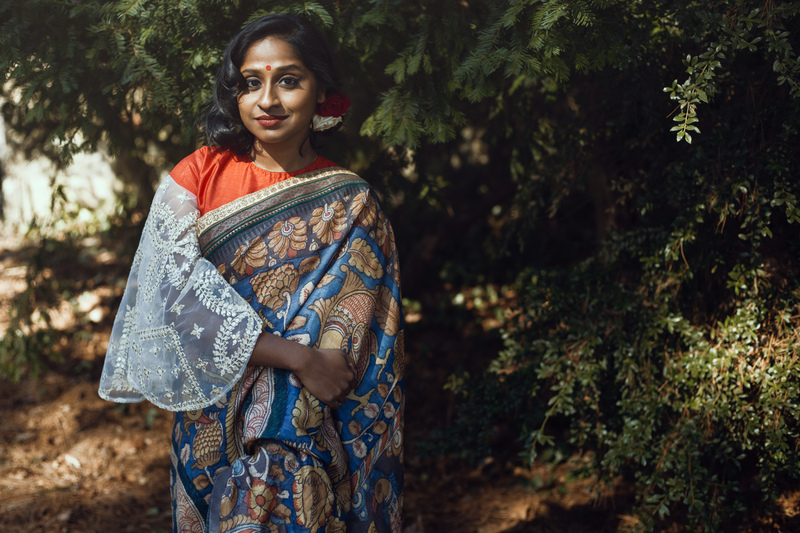 Being part of the body inclusivity campaign with Brown Girl Magazine and designer Ayush Kejriwal was more than just wearing a beautiful garment. I was empowered and proud to stand amongst women who had different stories to tell, came from different backgrounds and were various sizes and colors. It made for an unforgettable moment when we all came together to share our stories. 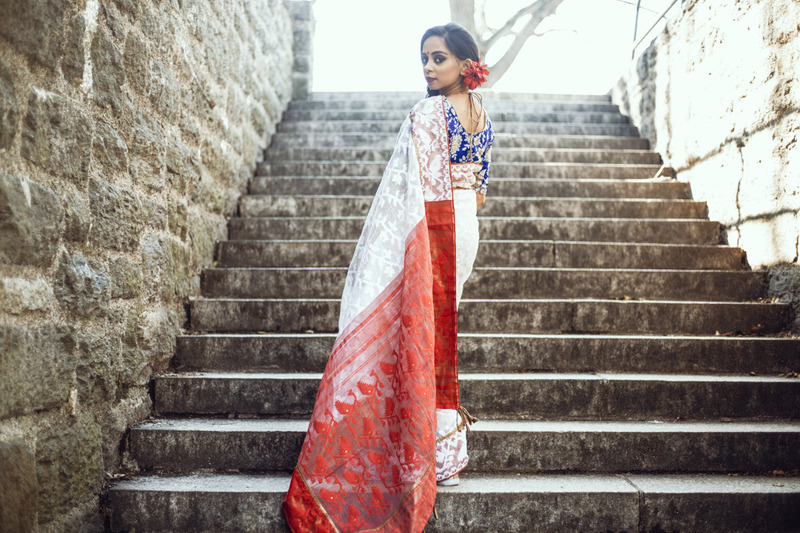 As I draped the intricate saree from Ayush Kejriwal’s collection, I was reminded of all the reasons why a saree to me is the most flattering garment in a South Asian trousseau. With its ability to be worn hundreds of ways, it clings and falls effortlessly. Its charm is that it’s one size, inclusive to all, allowing every woman that adorns it to feel feminine, graceful and beautiful. “I used to pay to get my hair straightened and if I didn’t have enough money to go to the salon I would sit in a chair and make my mom flatiron it. I wished I had blue eyes. I hated my love handles. My eyeshadow was never pigmented enough. I would put sunscreen on while I was in class because I didn’t want the sun to shine through the windows and make me darker. The only thing I had going for me was that I was slightly taller than the average girl. 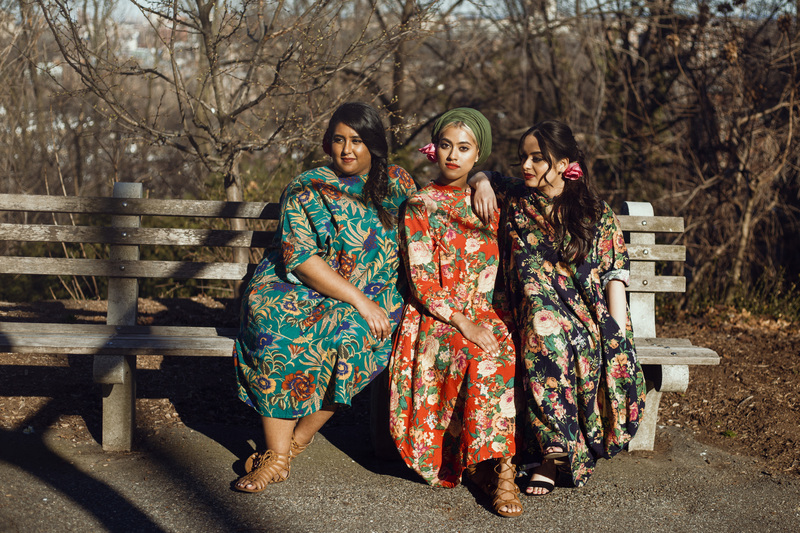 “I love the concept of this photoshoot because it displays the diversity of skin colors and body types in the South Asian community. Growing up, my skin was darker; I was bigger and taller than most of my friends. I could not relate to any model in the South Asian community. I would often look at mainstream media but found no one that looked like me. Society has had some unrealistic beauty standards and I’ve been a victim of body shaming for a long time. “I’ve been an avid fashion lover since childhood, but it has always felt like an unattainable dream that I could only admire from a distance. From childhood, my surroundings conditioned me to think only a specific type of beauty is allowed to dress up and wear nice clothes. Women who are 5’7” and taller or are size two or smaller are the only ones entitled to be celebrated and have the opportunity to look their best and wear whatever they want. You scroll their social media, flip through magazines or browse through TV channels — media constantly reinforces only one type of beauty. The South Asian community and our culture are built on this very facet. I think most people don’t realize how impactful and dissuading physical judgment really is. Media’s representation of women and what is considered beautiful is an issue that scars gravely into the psyche of the woman, causing far more psychological damage that spills over into other aspects of our lives apart from the fashion industry. Ayush Kejriwal has cemented his brand to be that of a fighter. He is a pioneer in advocating for acceptance of inclusivity in fashion and the natural diversity of womankind. Collaborating with Ayush is one of the loudest statements that we as women could’ve made, with our concept echoing in the media and fashion industries. 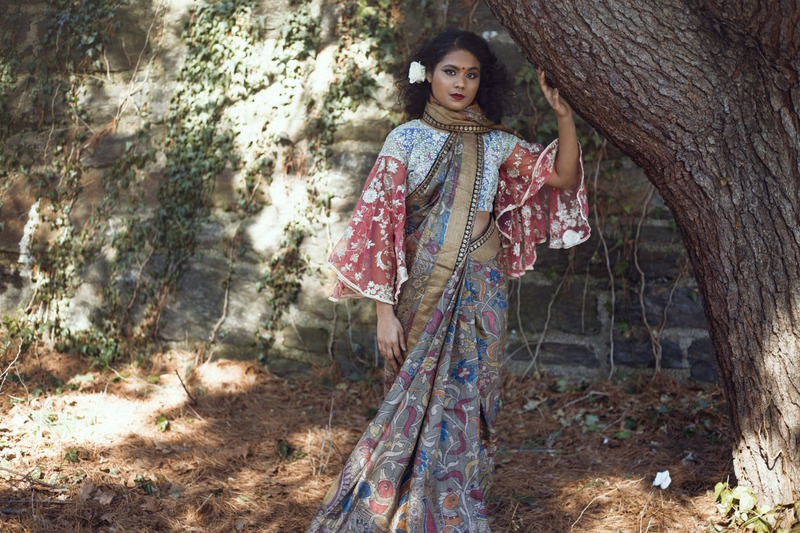 South Asian fashion is one that is lagging when it comes to being inclusive. 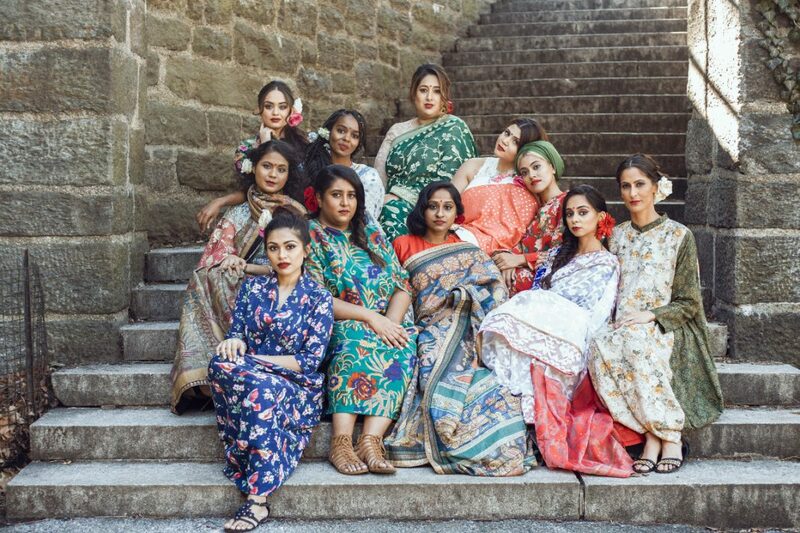 This idea of showing women from all walks of life is non-existent in Indian fashion. Starting from couture brands down to the local shopkeeper who dismisses a woman who doesn’t abide by the superficial standards of our society. “Growing up, I always felt too short, too dark, too ordinary for high fashion. All the women I saw wearing my favorite fashion designers were marvelously tall, in fantastic shape, with seriously sharp facial features. All things I would never be. 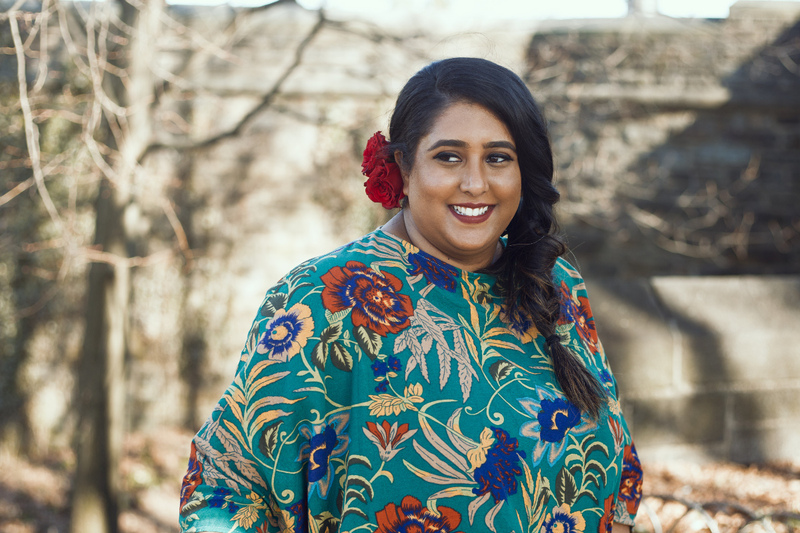 I stand tall at a whopping 4’11 (I’m a giant, I know), I happen to be one of the darkest skin colors in my Gujarati family, and my button nose and chubby cheeks never exactly screamed model to me, or anyone else for that matter. While these unrealistic beauty standards in the fashion industry did create an air of majesty and larger-than-life elegance, they also distorted what fashion was meant to do. To me, fashion has never been about putting beautiful clothes on flawless models. Fashion is a form of expression that allows the everyday woman to look and feel her best. It has always been about taking an ordinary day and making it feeling extraordinary. 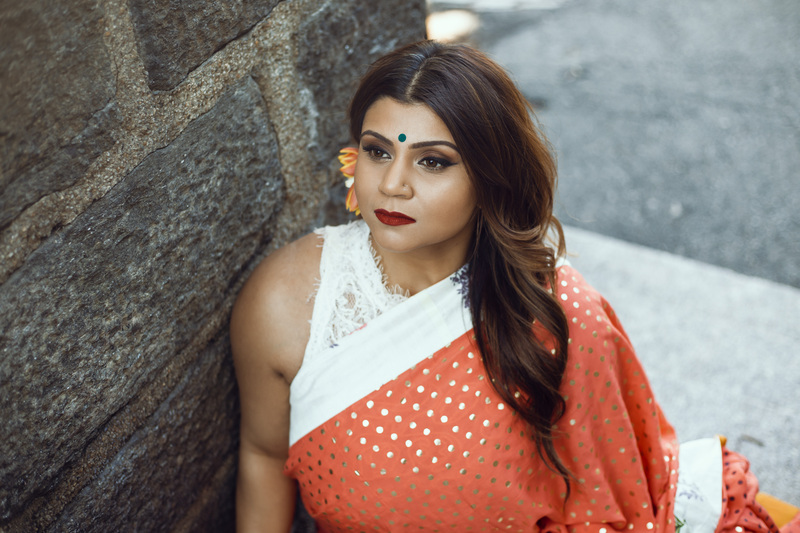 Being a part of Ayush Kejriwal x Brown Girl Magazine’s body inclusivity campaign was refreshing, and quite honestly, a much-needed reminder on what it means to feel beautiful in your own skin and the role that style and fashion can play in the way in which we perceive ourselves. I grew up with a unibrow, had braces for the majority of my high school and college years, was always very hairy, and I am shorter than the average girl. I spent years bleaching my face to hide the dark, thick, black hair on my chin, cheeks, sideburns, and neck, and I would lather layers of makeup to hide the scars from years of teenage acne. 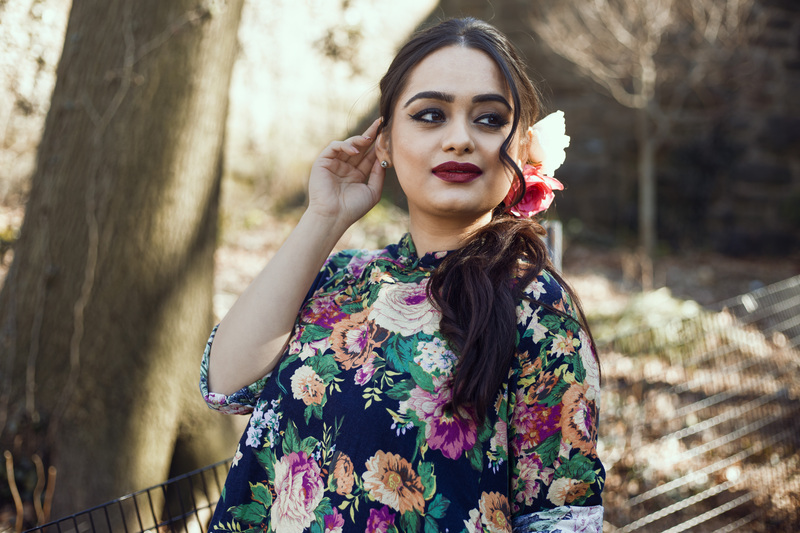 I’ve always been lighter than the average South Asian woman but that meant the hair on my skin was even more visible, so I never imagined I’d feel comfortable in front of a camera. Not wanting to wear certain clothes because I’ve gained some weight over the years, or not wanting to take photos showing my teeth, or not showing my side profile to hide my jawline are just some of the new insecurities I’ve added to the list as an adult. But now that I am well into my late twenties, I wish I could just feel enough and not spend another two decades criticizing myself. Standing amongst the models we chose for this collaboration with designer Ayush Kejriwal, I honestly felt whole. There’s a huge void of ‘real’ bodies and faces in the fashion industry — millions of brands and ad campaigns in both western and eastern media are spewing lies and propaganda to young women and men by Photoshopping everything we see. They’re dictating how we should look, even though it’s fake, and they’ve been successful for centuries, but we say no more.